Catherine de’ Medici (1519 - 1589), wife of the French King Henry II, is not widely known for her ventures into the realm of fashion. Remembered as a powerful political player at French court during the sixteenth century, she is better known for ruling as regent during two of her son’s reigns, and for her interest in magic and the occult. However, not only can she be commended for her deft navigation of politics at French court, Catherine must also be applauded for her persistent experimentation with fashion. As well as attempting new beauty rituals and wearing the first high heels in France on her wedding day to improve upon her short stature, she chiefly introduced the famed perfumed gloves to court. Scented gloves were already popular in her native Florence, and through her marriage to Henry, Catherine brought these cultural novelties to France. Renato Bianco (or Rene de Florentin as he was known in France) was Catherine’s personal perfumer and she continued to employ him to make perfumed gloves for her in her new home. With the unhygienic atmosphere and odorous nature of a bustling sixteenth-century royal court, the gloves worked to mask personal aromas. As an easily removable item, glove wearers could even change their ‘scent’ throughout the day by switching pairs. The gloves themselves could be perfumed with an array of fragrances, including pomegranate, orange blossom, jasmine, and violet. Instead of having these ingredients stuffed into the gloves though, they were mixed with animal fat and boiled. Then the gloves were dipped into the liquid and left outside to dry. Through this process not only did the scenting treatment serve to cover the unpleasant odors of French court, it was also done to mask the smell of the gloves themselves. Typically, fashionable gloves were made from leather, and animal excrement was used in the leather tanning process, to create the smooth texture of the finished product. Unsurprisingly this also produced a foul smell. As expensive and luxurious items though, the scented gloves quickly grew in popularity at court and throughout France. The fashion also spawned other perfumed clothes, such as fragrant doublets and shoes. Catherine also remained closely associated with the fashion. 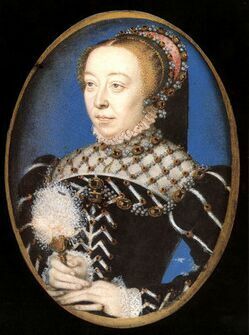 Shortly before a marriage match in 1572 between Catherine’s daughter and the son of Jeanne d’Albret, Queen of Navarre, the groom’s mother died. Accusations were made that before her death Jeanne had been sent a pair of poisoned perfumed gloves by Catherine. There is no evidence to suggest these the allegations were true, and it is far more likely that Jeanne actually died of tuberculosis. Yet the rumours persisted, and the poisoned gloves became the weapon depicted in Alexandre Dumas’ novel, La Reine Margot (1845), that concerned the events. Perfumed gloves continued to be in fashion though throughout the late 16th century and early 17th century as items of prestige and costly gifts. In England, Elizabeth I is credited with “inspiring the craze” (1). 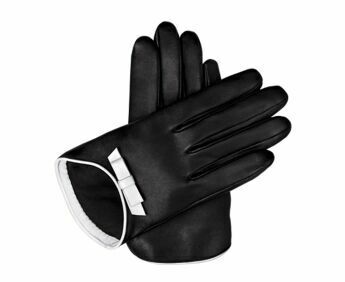 In France the tradition triggered by Catherine even continues to this day, with modern brands such as the House of Guerlain still producing perfumed gloves. (1) Holly Dugan, The Ephemeral History of Perfume: Scent and Sense in Early Modern England, (Baltimore: The Johns Hopkins University Press, 2011), 132. 1. Connor, Steven. The Book of Skin. New York: Cornell University Press, 2004. 2. Dugan, Holly. The Ephemeral History of Perfume: Scent and Sense in Early Modern England. Baltimore: The Johns Hopkins University Press, 2011. 3. Redwood, Mike. Gloves and Glove-making. Oxford, Shire Publications Ltd, 2016. Clouet, François, Catherine de Medici, ca.1555, watercolour on vellum. Victoria & Albert Museum.